Thor and Cobra, top rated power inverter brands, are right here at RoadTrucker. Cobra, a long trusted name in electronics, offers an extensive line of power inverters providing safe power solutions for critical situations like power failures. The larger Cobra Inverters have an optional Remote Switch. 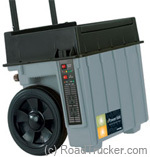 Thor modified sine wave inverters are RoadTrucker’s choice. Thor Inverters are rated 15% lower than their capability. Just the opposite of most other Inverter manufacturers who fudge on the max power capability of their inverters. Thor Delivers consistent and efficient power that is enough to run most devices, these inverters are one of the most reliable units on the market today. To save on battery usage, the Thor 1000, 1,500. 2000, 3,000 and 5000 Watt inverters can be remotely switched off, when not in use, with Thor's Modified Inverter Remote Switch. we have made it easier to add a remote switch, where needed, by simply checking the box before checking on the Add to Cart button.. When you are out on the road, there is one thing that you should not be without. That is dependable convenient portable 120 volt power for those home appliances and electronic items that make your life comfortable. Be at ease when you go out camping, hiking, or travelling and do not worry about power because you have all you will need, here with Thor and Cobra inverters. as they do draw power from the battery. This powerful Thor 1500 Watt inverter features state-of-the-art circuitry designed to handle temporary high surge loads. Start running your cell phones, electric motors, pumps, color TVs and electric heaters from a 12V DC power source with this 1500 Watts power inverter from Thor. This inverter has Smart Surge Control (SSC) that ensures smooth start-up for appliances and tools. It also has a low noise/self adjusting cooling fan. The very powerful THMS3000 has a voltage protector that will automatically shutdown whenever the input exceeds 17 volts DC or is less than 9.5 volts. The Thor 5000 Watt Power Inverter THMS5000 features high surge capability, On/Off Switch to conserve power, mounting feet for easy installation, 42 amp hardwire block and Optional remote control function. The Cobra CPI890 power inverter has a continuous power of 800 watts and a surge power of 1600 watts. It has a low voltage alarm of 10.5 volts and low voltage cut-off of 9.5 volts. The Cobra CPI1000 converts battery power to standard AC plug-in power. It has a continuous power of 1000 watts and a surge power of 2000 watts. This power inverter has three AC receptacles plus a USB output with power failure protection. The Cobra CPI2590 has three AC receptacles and a USB output, pentagon protection. The CPI2590 is ideal for a power failure situations. The input voltage range of this product is 10-14.9V DC and output voltage range is 115V AC +/-5%. The Xantrex 1500 Watt Portable Generator can supply household electricity up to 1500 Watts. It can be as your Home Backup Power Source.